Shades of “The Prince and The Pauper,” with a gay twist. Delightful! Story blurb: Vali Florescu, heir to a powerful local boyar, flees his father’s cruelty to seek his fortune in the untamed Carpathian forests. There he expects to fight ferocious bandits and woo fair maidens to prove himself worthy of returning to depose his tyrannical father. But when he is ambushed by Mihai Roscat, the fearsome Crimson Outlaw, he discovers that he’s surprisingly happy to be captured and debauched instead. 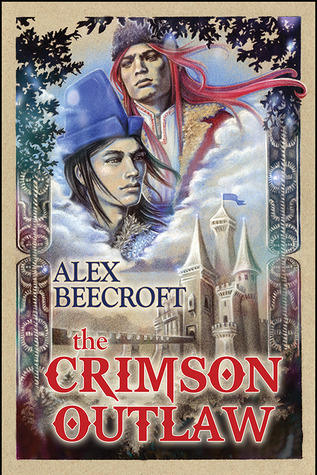 Although I was already familiar with Alex Beecroft’s outstanding writing (having reviewed several of her books before), I must admit that when I first saw The Crimson Outlaw [Riptide Publishing, August 10, 2013], it was the luscious cover by Simoné that caught first my eye. Happily, the writing matched the cover, so it made it a delightful package indeed. The story blurb capsulizes the plot quite well, and so I will focus on the other aspects of the story that made it such a delightful read for me. The first, of course, has to be the unique setting. Off hand, I can’t think of another GBLT novel set in Romania; certainly none that I have ever come across. In a way this is surprising because it has so many romantic aspects going for it—the rich and colourful Magyar traditions, and the fierce gentry for example. Second, the castle intrigue. I mean, a castle just isn’t a castle unless it has some intrigue surrounding it. So, in this case we have Vali trying to save Stela (his sister) from an arranged marriage with a much older and homely man; Vali against Wadim (his cruel and tyrannical father); and finally Vali and Mihai, the handsome outlaw, both of them against Wadim. Finally there is the character develop that kept me convinced right down to the minor supporting cast. It made them both real and understandable. Altogether this novel answered my quest for a somewhat unique story that didn’t involve vampires and werewolves, and that wasn’t preoccupied with the perils of coming out and/or self-introspection. So bravo … or in Ms Beecroft’s case, Brava! Five bees.